What makes Relax Saunas different from other far infrared saunas? View part 2 of the video and transcript here. The only Sauna with computer-programmed ceramic semi-conductor chips that filters out ALL of the non-healing light rays. ​​It is the only Sauna with computer-programmed ceramic semi-conductor chips that filters out ALL of the non-healing light rays, so that you can totally absorb the healing far infrared rays of 4-14 microns, and not have to resist any other energies. The Relax Sauna is made with 40 pieces of hi-tech temperature controlled semi-conductors. The wavelength & temperature are controlled by the program. The wavelength is between 4~14um, which is easily absorbed by our body, penetrating deeply. Very LOW EMF near the body. The radiators are down near the feet unlike most saunas which have panels which emit EMF all around the body. "Now I know the Relax infrared sauna does not look impressive, making it hard to believe that the best is not necessarily the most expensive and nicest looking one. Especially when you compare the Relax Sauna to the beautiful wooden saunas...that have built-in stereos, lighting and that spa-like feeling. I understand your gut reaction. For the last 10 years I have turned my nose up at the Relax Sauna every time I saw them at the health conferences until this last year when I tried one. I was sold on the Relax Sauna within the first 3 minutes! Right away I could feel the difference. No preheating like with the wooden saunas. In the Relax Sauna, I experienced instant relaxation from the higher quality infrared." "I can't tell you how much difference the RELAX Far Infrared sauna has made. I feel years younger in 4 weeks of using. 80% or more of my Lyme symptoms are gone. My skin is amazing (a great side effect and I have the skin waters). I've cut my sleep need by 4 or 5 hrs. (chronic fatigue symptoms from Lyme), feeling real relief from the inner scars from internal work years ago that has always bothered me. I've had a chance for years to try these for 5-10 mins between lectures at conferences. this is the first time I've had 15-20 mins at a time ( I'm doing 10+ on high...turn to low for another 5 mins. Times I'll shut it off an do a few more mins again. 7-10 mins sure helps wake up although its great before sleep. I’m just thrilled. I’ve met 3 other people who bought the Relax sauna for Lyme. One has a wood infrared but it didn’t do the therapeutic job that the Relax Sauna does. We have hundreds of video testimonials! Check out our Youtube Channel for hundreds more videos and testimonials. The Relax sauna is the preferred sauna by those looking for an infrared sauna and especially among those who have felt the Relax sauna. 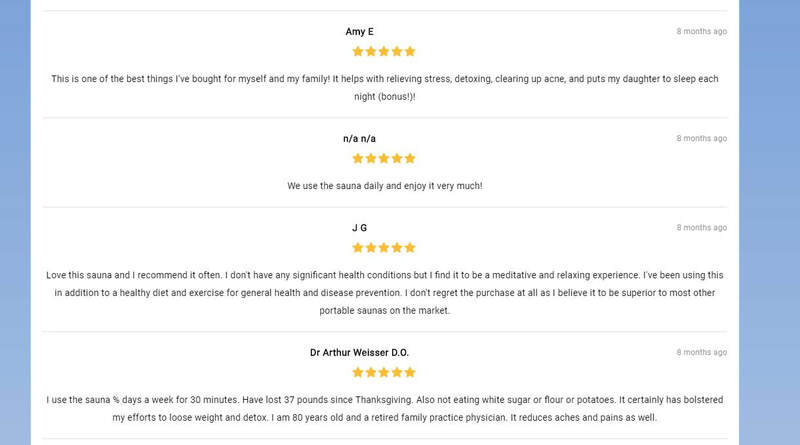 As evidenced by over 500 video testimonials on Youtube, many by those who have used wooden far infrared and other portable far infrared saunas in the past. Let the World know what you think of it by posting a quick review here. Let your friends know about the Relax Sauna! Read articles about the benefits of far infrared. Karen Russell purchased a sauna from us at the American College of Alternative Medicine show in Phoenix in November, 2007 after talking to Doris Rapp, who wrote the excellent book: Our Toxic World. ​Karen had struggled with Heavy Metal toxicity for 2 1/2 years. She had tried numerous products, of which she received partial relief. It only took 4-5 weeks to get her lead and mercury levels down to normal once she started using the RELAX Brand Far Infrared Sauna. She also experienced incredible benefits in reduction of cellulite (65-70%) over the next 3 months, and additionally was able to get rid of flab as well from having previous lost weight. She was amazed at how the Relax Sauna was instrumental in toning up her whole body. ​Click here for educational information about the benefits of Far infrared ray energy. Try for 1 month risk-free. Satisfaction guaranteed. Comes with a 1 year warranty and we have people who have had their sauna for 15 years and it still runs like the day they got it. No need to check for a lower price. We sell at the minimum advertised price for Relax Sauna products. If you see a lower price, let us know where and we will match. Truly portable. Fits in the included carrying case. This is the lie down version of the Relax Sauna. This far infrared sauna uses the same patented far infrared emitting radiators as the Relax sit up sauna. Get the same benefits of far infrared energy while lying down. Comes with a 30 day satisfaction guarantee and a 1 year warranty. Order 2 and get $50 off! Use the code 2lamps. Order 4 and get $100 off! Use the code 4lamps. For higher quantities contact us for wholesale opportunities. This lamp allows you to bring the same far infrared technology to your desk! It uses the same patented type of far infrared generators as the Relax Sauna. This is a compact version of the same far infrared emitting technology as the relax sauna in a small desktop lamp style configuration. You can use this to apply healing far infrared energy as you work right at your desk. Improves circulation in the skin, reducing wrinkles and speeds healing. ​The Sky Eye Medical Lamp (approved by the FDA as a medical Device) is used in many medical practices and clinics. It is extremely effective in wound healing, and in diminishing Diabetic Ulcers. It is remarkably fast at decreasing inflammation. Suitable for long hours of usage without risk of overheating/causing burns; FIR energy is compatible and readily absorbed by the human body. 360 degree rotational head and adjustable stand to suit any angle, height and intensity required by the user; any part of the body can receive treatment. *International shipping available. Add to cart and international shipping will calculated automatically. ​We will ship the model which uses your countries correct electrical wiring. The Relax Far Infrared Sauna contains patented ceramic chips which produce the highest and purest levels of far infrared found in any sauna. This technology is only available in the Relax Sauna. The owner of Relax Saunas of Momentum98 has been in the natural health business for over 35 years. He has brought many innovative products to the market over the years. The Relax Sauna has been our flagship product for over 10 years. All of our products come with a 30 day money back guarantee. You can order with confidence that if you are not satisfied for any reason, you can get a full refund. All Relax far infrared products come with a 1 year warranty. If you would like to find a Relax Sauna Demo location in your area send us a message below. Question or Comment? Contact us with this form.